Philips has expanded its Hue line of controllable color lamps to include more of the lights in the house: BR30 downlights in the US market and GU10 spots in Europe. 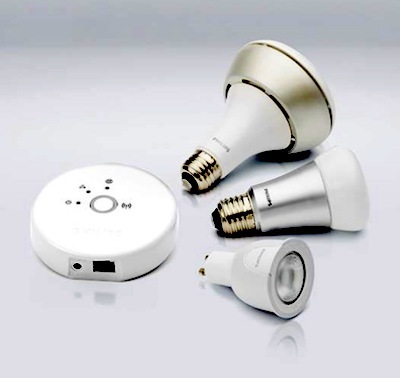 In North America you can now buy a set of three BR30 downlights and a WiFi/ZigBee bridge. Pricing is the same as the original kit of three A19 lamps and the bridge, at $199. Philips also expanded its collaboration with Disney to include a LivingColors Bloom-like luminaire intended for a child's room, which connects a controlled light to the narrative of specially created Disney e-books. The iOS and Android app controlling the Hue system has been updated to version 1.2, according to the press release, adding compatibility with iOS 7. It is not clear that any app changes were needed specifically to support the new Hue lamps, but changes in the developers' API probably were. According to Lee Hutchinson, writing for Ars Technica, one app improvement is that setting up Hue lamps to work with a new bridge has been greatly simplified. Before, if you had an existing Hue network and tried to introduce into it lamps purchased in a new Hue starter kit, getting the lamps to forget the bridge with which they shipped and to recognize the existing bridge was a "crazy procedure." The new version of the Hue app provides for a manual method to let the bridge discover new lamps. Hutchinson mentioned almost in passing one other update in the Hue app -- Philips told him that the security flaw we wrote about in August has been addressed, so presumably apps on the user's mobile devices now authenticate themselves to the Hue bridge in a secure manner. Slowly but surely, Hue is expanding to cover every socket and lighting niche in the Western household. What's next in order of popularity after the A19 and the BR30? The candelabra?